Tickets include admission to the event including appetizers and unlimited drinks. General Admission begins at 6:00pm. Enjoy an evening with colleagues, friends, legal and business professionals while having an opportunity to evaluate and refress your personal and professional image. The event will include a silent auction. Proceeds benefit the Ronald McDonald House Charities. For nearly three decades, Ronald McDonald House Charities of Central Ohio (RMHC) has been serving families with seriously ill children by providing a home-away-from-home at the Columbus Ronald McDonald House. 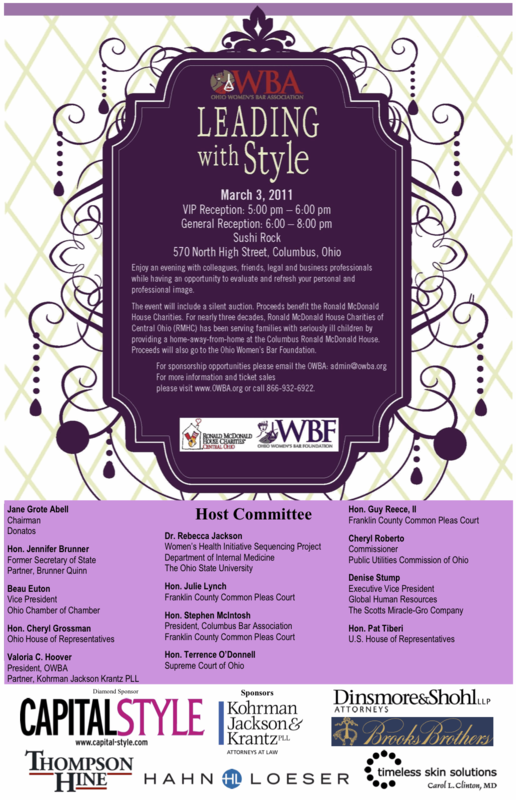 Proceeds will also go to the Ohio Women's Bar Foundation. For sponsorship opportunities please email the OWBA: admin@owba.org.